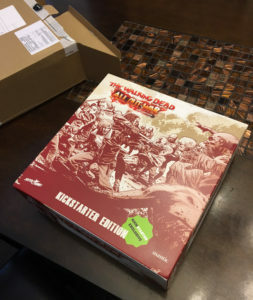 I recently popped over to Sean’s Gaming and Shooting Blog, a fellow Walking Dead: All Out War fan, to check out some of his painting techniques and stumbled across an end of the year post about yearly game challenges. Sean was pulling this from a post he saw at The Stronghold Rebuilt. (i) Select a list of Six games. These can be miniature, card, board or role-playing games. You may change entries on the list during the year, but game-plays for games you drop should no longer count towards the challenge. (ii) To start the challenge, post the link to your blog. (iii) You commit to play each of your six chosen games at least six times during the course of 2017. (iv) When you play a game in your challenge list, record the play in your blog. This record can range from a one line acknowledgment to a full blow-by-blow report. The challenge is one I’ve seen commonly on Boardgamegeek over the last few years. It’s one of these “quality over quantity” reactions the board gaming community goes through as we wrestle with the unending onslaught of thousands of new games that come out each year. Inevitably, our collections grow disproportionate to our free time and we end up playing a game once or twice before we have to move on and play the next exciting acquisition. This is something my friends and I debate quite frequently as we each have our own level of comfort playing the inevitable “new game of the week” while also wanting to revisit some of the fun times we had with last week’s (or last month’s) new game. It’s a hard balance to strike but we fight the good fight and still are able to mix in some older games each week. The main issue and the reason why we struggle with the concept of always playing new games is because games are not linear pieces of entertainment. They are not novels or movies or even some video games, to be consumed once and moved on from. They are open-ended, highly interactive, and never tell the full story in a single game or session. Looping back to gaming challenges, I think why challenges like this exist is to pull us back as consumers and remind us that we are gamers first and foremost. As gamers, we need to game. It’s not enough to acquire the latest hotness or some grail game you’ve pined after for years. That is merely the first step. The loading up of the caravan to start your journey. We fail if we never get out of the garage or, in this case, the game sits sadly shrink-wrapped on an ever cramped game shelf. I will accept The Stronghold Rebuilt’s game challenge this year (or what is left of it). I have a lot of plans for this year already so I like that this challenge is devoted to only six games and seems easily doable. This first item is likely obvious and should be the easiest to accomplish. I’ve already started my weekly series dedicated to this new gaming love affair and completed my first comic session report. I have plans for at least the next four or five with more rattling around in my brain waiting to be explored. It’s also solo-able which means I don’t have to force my friends to play if they don’t want. Perhaps another obvious choice. 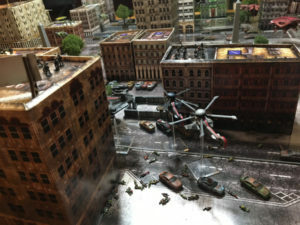 Dropzone Commander is my go-to social miniatures game at the moment and our group has a lot of momentum with it so I’m glad to see that this has a lot table-time left. Recently, our group is branching out into the local tournament scene so getting in multiple games of Dropzone shouldn’t be a challenge this year. Santorini is a new acquisition that is easily one of the most eye-appealing games in my collection. It’s an abstract game that plays quickly so I will likely go with Stronghold Rebuilt’s suggestion of considering a session of games as one “play.” A game this pretty sitting boxed up on a shelf is a travesty. Also known as a revision of the classic Speed Circuit from the 70’s. I don’t even own this game yet (as it is supposed to release in the next month or so) but I had a chance to play it at Gen Con and the “no-luck” aspect really intrigued me along with the promise of AI cars making the game solo-able. This one may struggle in this challenge if the AI car rules don’t ever make it out but I’m confident I’ll still make it work. Yes. Another miniatures game. I know. BUT! This goal is a little unique in that I want to just get through the 6 games of the Suicide Squad campaign from Knight Models’ new Suicide Squad starter package. It looks like a lot of fun and, well, I’ve already bought the minis when I tried to swear off getting into another minis game. I gotta justify it somehow so it is a prime target for the challenge. This last item I’m going to hold in reserve as I want to poll my friends to see what game I should put on this list. I learned from my last gaming challenge years ago where I vowed to play every game in my collection at least once, that taking on a challenge like this can force your friends to also commit to such a challenge, whether they want to or not. That hardly seems fair so I will poll them and have them weigh in on what game they would like to hit six time this year. Should we finally start that Pandemic: Legacy campaign? Maybe run through a Descent App Co-op? Bludgeon 7 Wonders: Duel to death with repeated plays? Prep for Gen Con with some challenges of The Duke? Flick it up with Crokinole, Catacombs, or Flick ’em Up!? Hit a sadly missed game in their own collection? Let me know, Gentlemen. You know who you are… I’ll announce the game next week. We’ve been wanting to do a Legacy game for a while now. We tried Risk Legacy but then some friends moved away and the game died. Hopefully we’re more successful with this version. I’m glad to hear you are joining the challenge. Your thoughts on the challenge (and others like it) was well written and interesting to read. I look forward to reading your game reports.